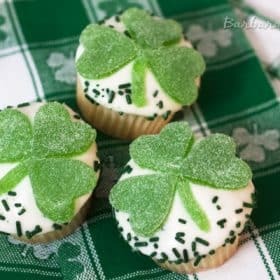 Luscious lemon cupcakes topped with lemon cream cheese frosting, sprinkles and a cute gumdrop shamrock. Liz, the Cupcake Lady at Hoosier Homemade, has a fun new eBook, Cupcakes! 12 Months of Happiness. In “Cupcakes! 12 Months of Happiness” you will find a cupcake for each month that is sure to please children and adults alike. Some of them were inspired from Cupcake Tuesday and some are from the Cupcake Chronicles Newsletter. But all of them are newly designed to make them easy and kid-friendly. Liz gave me a copy of Cupcakes! 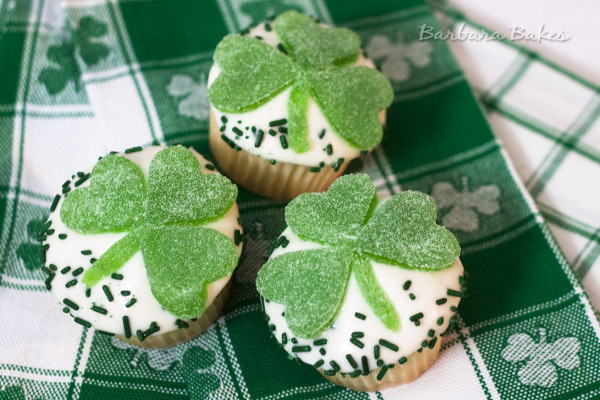 to review and cute, easy-to-make shamrock cupcakes are the March cupcake. The adorable bunny and pretty flower cupcakes would also be perfect for spring. I made lemon cupcakes with a lemon cream cheese frosting, but you could use any flavor you liked best. Combined cake mix and lemon juice powder. Add buttermilk, oil and eggs and mix and bake according to package directions. In a large bowl, beat together butter and cream cheese. With the mixer on low speed, add the lemon juice powder and powdered sugar a cup at a time until smooth and creamy. Add more powdered sugar if necessary to get a thick spreadable frosting. Liz also offered to giveaway one copy of Cupcakes! to one lucky Barbara Bakes’ reader. To enter just leave a comment on this post before before Thursday, March 22 at noon, MST, and tell me what is your favorite way to dress up a cupcake. Leave a separate comment for each entry. Be sure your email address is included with your comment(s). Winner will be chosen randomly and notified by email. At first, I thought you used white fondant for this cupcake. I was surprised it was cream cheese frosting. You managed to put the gumdrop without messing up the frosting.